With all the celebrity chefs opening restaurants in Adelaide, Sydney-based chef Sean Connolly is one of them. 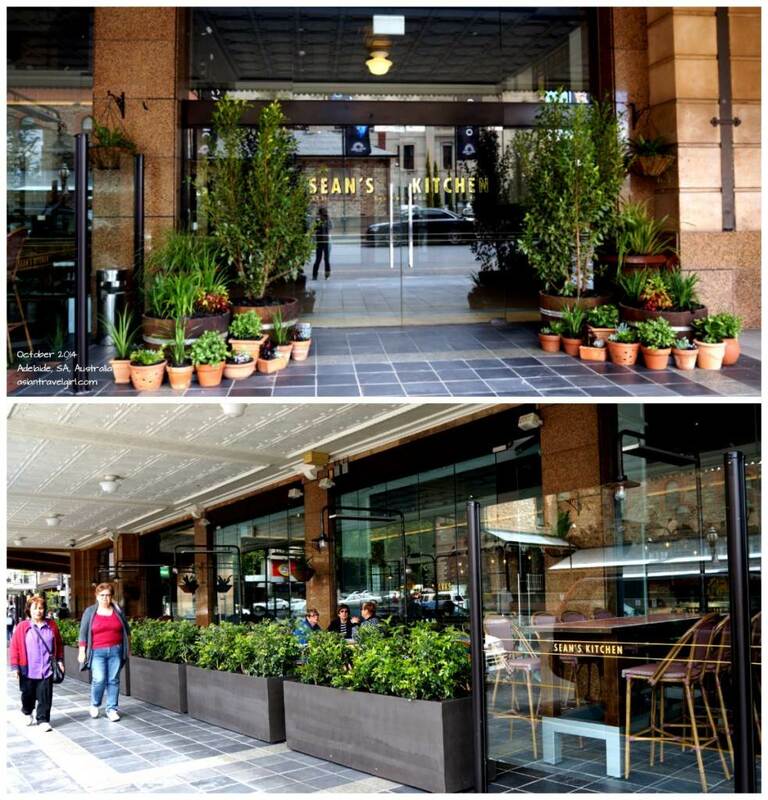 The location of the restaurant is within the Adelaide Casino itself with an outdoor entrance that does not interfere with gambling at the haydock track or the bingo halls (hence no security checks). We went there for lunch a week after its opening, I quite liked the fact a lot of plants were displayed on the outside to reflect the use of fresh produces. 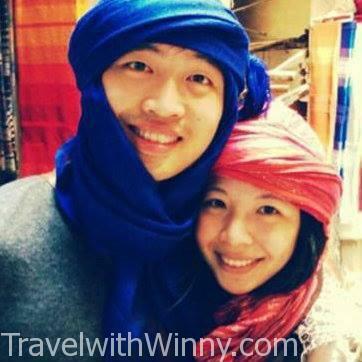 There were also outdoor settings for people who would like to enjoy food with natural breeze. The interior of the restaurant has a “street feel”, even though we were dining inside, they tried to make it so the space is continuous towards the outside area by placing street lamps on top of us and wooden bench seats through out the restaurant. Reminds me of Vegas. The service was above average and the waiters were fairly attentive. Our waitress for the table never failed to refill our water through out the whole duration. However when we question her about certain dishes on the menu, her excuse of not knowing more would be she missed the tasting session or she hasn’t tried it before. Which I thought was slightly under-trained. The menu contains a mixture of sharing plates, entrees and mains. 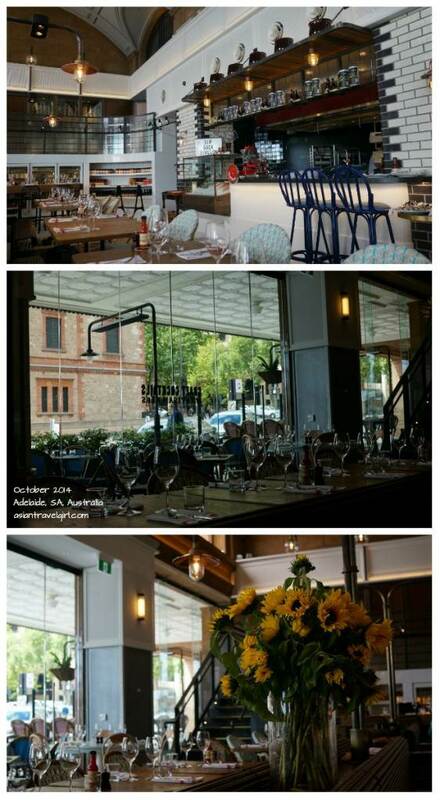 This menu has recently made it into Adelaide news because of the food disparity. On the same menu you can have a 50 grams of caviar costing AUD$400 or a beef burger costing only AUD$20. York and I decided to order 5 small dishes to share to try out Sean’s cooking. 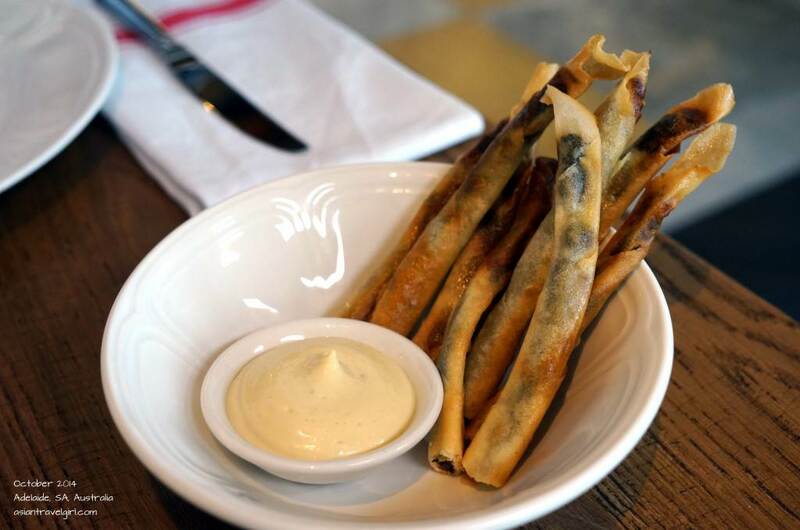 The first two entrees we ordered were “Crab “n” Cheese Melt: king crab, béchamel, cheddar” and “Mushroom Cigars: roast garlic mayo”. I think we have found York’s favourite dish of the day. 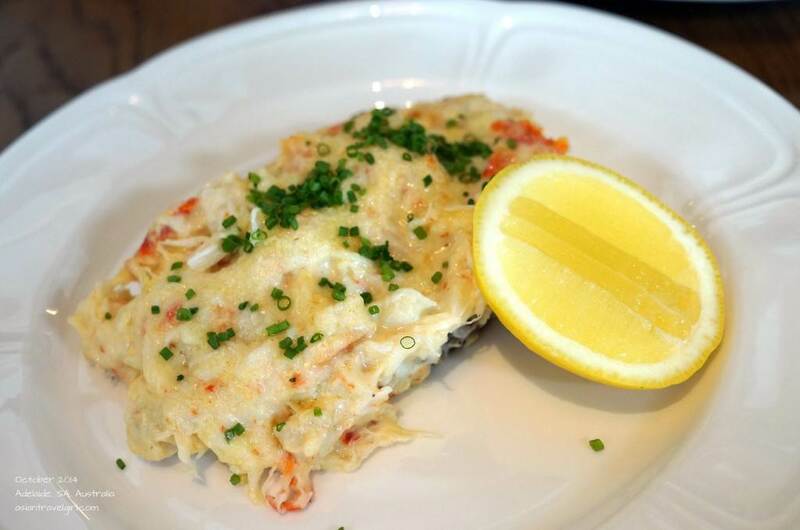 The Crab “n” Cheese Melt was a mouthful of deliciousness. The amount of king crabs given were very generous, York loved the taste of crab meat without having to remove the shells. Certainly more generous than any crab linguine we have tried. The melt was on a rye bread, another tick for healthy food option. The Mushroom cigar tasted a bit like normal spring rolls. Deep fried with mushrooms inside. Again, there were a lot of mushrooms. The next two dishes we ordered were “Lemon & Saffron Spaghettini” and “Waldorf “Moderne”: poached corn fed chicken, apple, celery, smoked almonds”. 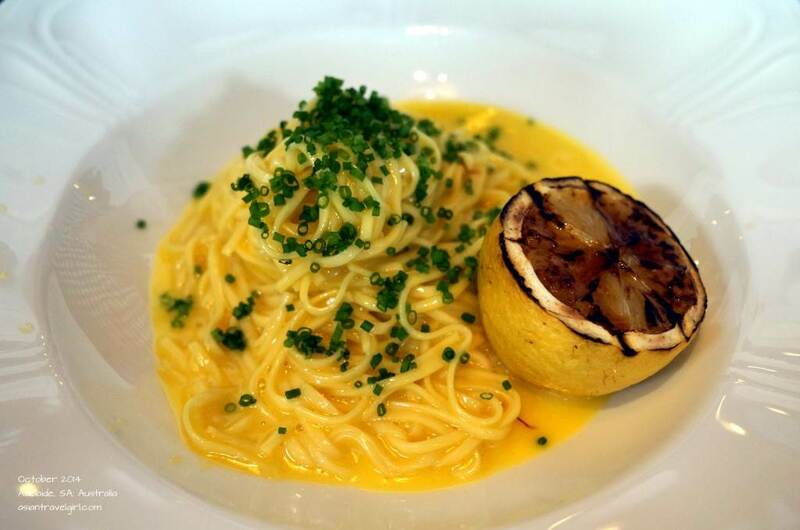 The lemon and saffron spaghettini was very creamy with a very strong lemon taste. It was very different to pastas I normally had. The pasta was cooked nicely and was quite refreshing at the start, however after awhile the cream started to make me feel sick. When we asked our waitress what is Waldorf “Moderne” salad like, she said it was like a normal salad but with chicken in it. She was not wrong. 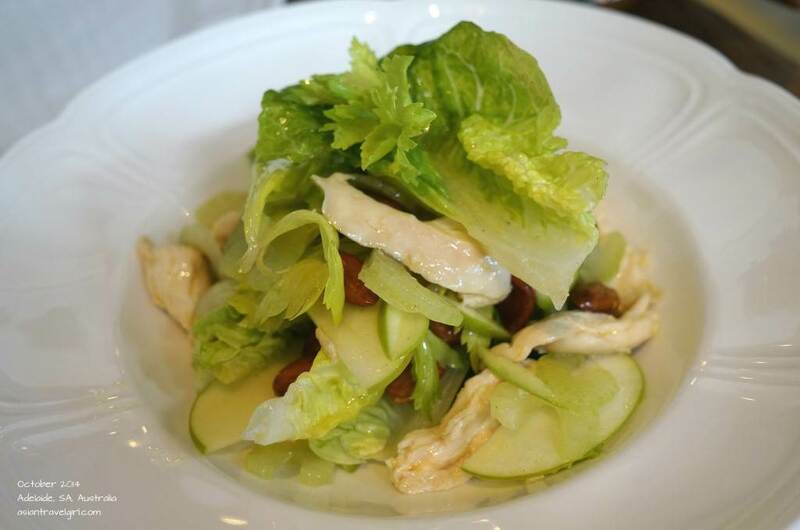 There were a lot of lettuce (I do think it is a waste to order salads with too much lettuce in a restaurant), the almond was smoked quite well and the chicken was very tender. It was a refreshing dish and a very ordinary salad. We had heard good things about the chips, however we felt it was quite ordinary. 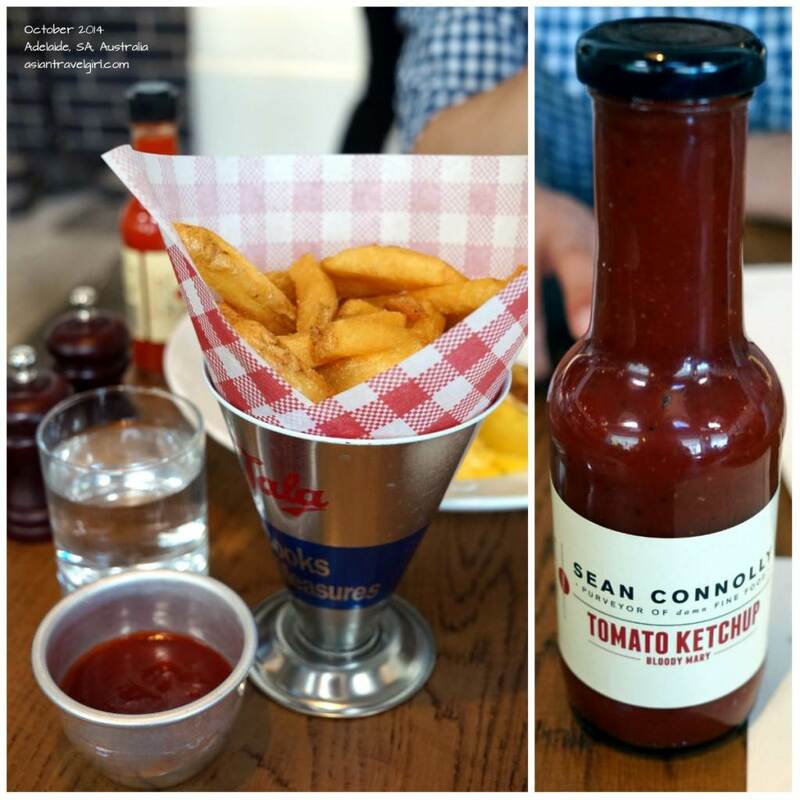 However the tomato ketchup was something I kept mentioning to people when they asked me how was the dining experience at Sean’s Kitchen. 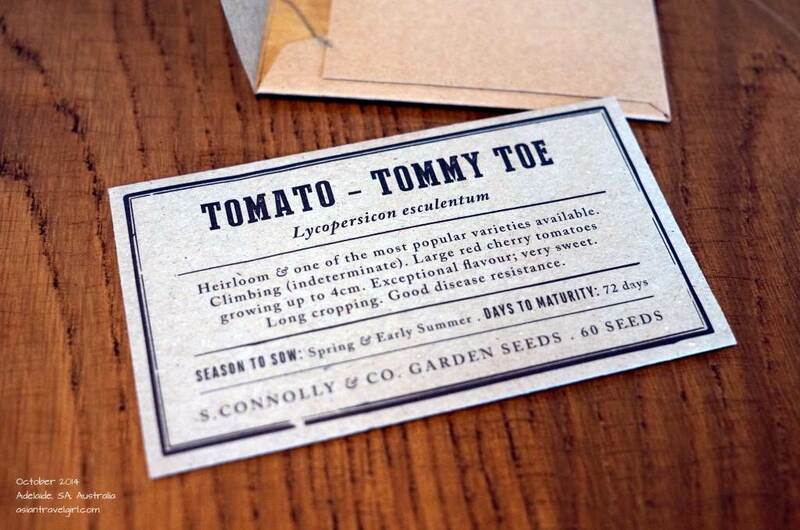 It was a special blend created by Sean Connolly himself, containing hot chilli sauce, lemon juice and celery seed. The taste of celery was quite strong. No wonder the name of this ketchup is called “Bloody Mary”. You can buy it for AUD$10 if you like the taste of it. Overall I think this place is a lot better than Jamie Oliver in Adelaide @ Jamie’s Italian, both the ambiance and the food is a lot better here at Sean’s Kitchen. Apparently if you dine here at dinner time, Sean Connolly comes out greets each table personally! I heard he is here for another month or so, so for people who wants a photo with celebrity chef, better come dine here soon!